Most large industrial and commercial applications have unique needs requiring custom specifications. In this brochure, we will limit the scope of our discussion to the outdoor generator enclosures. There are several factors that would determine the right type of enclosure that would fit the specific needs of a customer. Some contractors and engineers may prefer indoor generator installation that are shielded from the environment, however, that option is not always available which drives the generator installation outdoors in a purpose designed enclosure. For the outdoor applications that require a generator set to be installed in an enclosure, the overall cost and ease of installation will depend on the location of the system. With several choices for enclosures for your generator, selecting the right one can be a daunting task. “There are many things to consider while selecting the right enclosure that best fit the customer’s needs,” said Muhammad Armaghan, product manager, Generac Industrial Power. “Some of the most important parameters to consider include space availability, local sound attenuation requirements and local weather requirements.” He said several types of enclosures exist so customers can have complete customization for their application. The first thing Armaghan said needs to be considered is space availability. Knowing the space where the generator is located will help determine the size and type of enclosure. A walk-in enclosure is a great option if you have the space. It often includes sound attenuation, as well as space for power switching and monitoring equipment, lighting, fuel tanks and other equipment. They can also accommodate insulating and heating capability. Local inspection officials may treat walk-in enclosures as a building. “A person can easily walk around inside the walk-in type enclosure,” said Armaghan. “This type of enclosure is easily serviceable, but this type of enclosure can be expensive and can take up a lot of space.” If space is limited, this type of enclosure may not be best for your project. Another parameter to consider is local weather conditions. Weather-protective enclosures protect the gen-set from the elements. They do not retain heat or hold temperatures above ambient in cold weather or provide cooling beyond the ventilation and airflow offered by incorporated louvers or perforated panels. Sound attenuation is minimal and access panels or doors are required for maintenance and inspections. “The advantage of a weather protected enclosure is that it keeps the generator safe from weather elements like sunlight, rain, snow, high winds and so on,” said Armaghan. He said generators with factory, weatherproofed enclosures are specifically engineered for outdoor performance and Generac or another manufacturer has already tested and proven the reliability of the enclosure and unit. The enclosure is designed to minimize sound and vibration, while maximizing airflow. Before making the purchase, Armaghan said another parameter to consider is the local requirements. For instance if the generator is installed close to a hospital, senior assisted living facility or a residential area, the generator cannot exceed a certain sound decibel emission level. Sound-attenuating enclosures are specified when noise reduction is needed to meet local ordinances. These enclosures are generally larger and more costly than strictly weather-protective enclosures due to the design features required to reduce generator set noise. “A noise cancelling enclosure provides additional damping of the sound emitted by the generator while in running condition,” said Armaghan. While local codes and zoning laws often require nominal noise reduction strategies, end users are currently driving the demand for quieter gen-set installations. The cost to do so is generally quite low, and manufacturers have made the job easier by making engines that run quieter and with less vibration. Noise zoning ordinances typically set noise limits based on what can be measured at the property line. Since sound diminishes as the square of the distance from the source, simply increasing the distance from the property line may be enough to meet local regulations. Municipal codes should be reviewed and assessed to make sure that their requirements are achievable. A common requirement is an upper limit of 70 dB during the day. The noise floor due to human activity (traffic, etc.) can easily bring the ambient conditions above 55 to 60 db during the daytime. Certain activities such as yard work will exceed such ordinances on a regular basis. With standby and backup power generators there is no one size fits all solution. For outdoor applications, the key factors to consider are available space, weather patterns and sound considerations. There are pros and cons to outdoor generator placements with many factors needing to be taken into account. Federal, state and local codes must also be considered. The best solution is your local generator distributor. 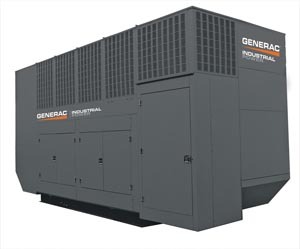 “Generac’s local industrial dealers are the experts when it comes to providing a completed generator installation, start up and serviceability solution,” said Armaghan. “Our experienced dealership network can provide a complete generation solution starting from selecting the right size, fuel type, enclosure type and installation location.” Contact us with any questions! In natural-gas-fueled generators, a popular method for reducing and controlling emissions levels is to use catalytic reduction and air-to-fuel ratio (AFR) control. This can be applied to either a rich-burn or lean-burn engine. Choosing between the two comes down to what the customer’s application needs are. In standby applications, the benefits of rich-burn technologies outweigh those of a lean-burn approach. These benefits include improved emissions, better starting and load acceptance (including block loads) and superior tolerance of ambient operating conditions. This article will discuss all AFR approaches and explain why the rich-burn alternative is more appropriate for emergency standby power. 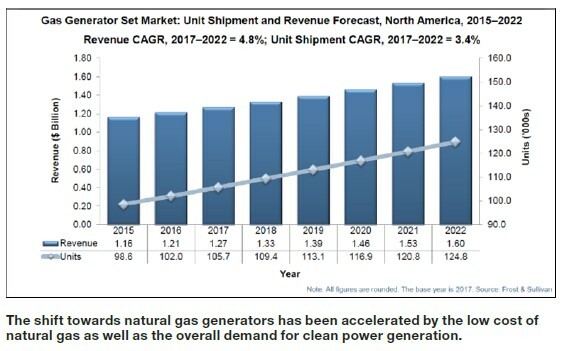 The shift towards natural gas generators has been accelerated by the low cost of natural gas as well as the overall demand for clean power generation. Severe weather and the power outages that result are likely to continue boosting natural gas generator demand in the industrial market. Natural gas is a virtually unlimited fuel source because it is utility-supplied, and its already clean-burning properties mean little to none of the expensive exhaust aftertreatment found on today’s diesel-fueled gen-sets is required. As such, the gas generator set market segment is expected to grow up to $1.60B in North America by 2022. Nonetheless, a popular method for reducing and controlling emission levels is to use catalyst reduction and air-to-fuel ratio control. Choosing between a “lean-burn” or “rich-burn” air-to-fuel ratio (AFR) comes down to what the customer’s application needs are in terms of fuel flexibility, reliability, cost and standards compliance. Lean-burn gas engines sometimes operate at higher loads, but rich-burn engines can achieve lower emission levels and generally have better transient load capability. Stoichiometric: Stoichiometric AFR contains a precise ratio of air to fuel, and it produces a chemically complete combustion. The (λ) for stoichiometric AFR equals 1.00. In a stoichiometric AFR mixture, there is just enough air to burn each fuel molecule, with no excess. Rich Burn: Rich-burn engines operate with the AFR at a higher concentration of fuel to air. It is a “fuel-rich” mixture. Rich-burn engines generally operate with (λ) equal to 0.995. Lean Burn: Lean-burn engines operate with an AFR that has a lower concentration of fuel to air, making it a “fuel-lean” mixture. Lean-burn engines operate with (λ) anywhere between 1.5 and 2.2. This means that there can be twice as much air present than is theoretically needed to burn each molecule of fuel. By contrast, lean-burn technology offers poor block-loading capabilities as well as poor performance at higher temperatures and altitudes. Most lean-burn engines also require selective catalytic reduction (SCR) exhaust aftertreatment, which is costly and requires high maintenance. Local emissions regulations may allow lean-burn engines to operate without an SCR, but they can still be required to have an oxidation catalyst to control carbon monoxide (CO). Let’s look at some of the benefits of rich-burn engines in standby applications in more detail. When equipped with a three-way catalyst, rich-burn gen-sets provide the lowest emissions when compared to lean-burn units. A Generac factory-supplied three-way catalyst is a cost effective and easy-to-install product that can also act as a muffler. A rich-burn engine with this catalyst typically has oxides of nitrogen (NOx) emissions that are an order of magnitude below the engine-out values of the most advanced lean-burn engine technologies. The smaller quantity of air and more stable basic combustion allow a rich-burn engine to perform more consistently through weather changes, i.e. humidity, temperature and barometer pressure. Rich-burn gen-sets also have a higher fuel antiknock tolerance than a lean-burn engine. This allows for greater fuel quality variation and operation on “hot” fuels like HD-5 propane. Rich-burn engines perform better in emergency standby applications because of their ability to accept a block load and operate at a wide load range. Lean-burn engines do not accept a block load well and perform poorly under varying loads. From a customer standpoint, this is typically quantified through application of the ISO 8528 standard, where the G2 class is typically the applied level from diesel generators. Rich-burn generators are capable of complying with the tight G2 performance standards, whereas lean-burn generators have to declare modifications to the stringent performance standards. Along with emergency standby applications, Generac has optimized its rich-burn technology to be used in energy management applications such as demand response and peak shaving. The aforementioned benefits mean a low capital cost, allowing the end user to substantially decrease their peak demand charge compared to lean-burn engines. Given the higher running hours in energy management applications, the typical industry thinking is that the fuel consumption advantages of the lean-burn solution will favor its use. However, the engineer must look at all capital and operating expenses in such an analysis to determine the optimal solution for the customer’s application. There are many cases in which high-power-ratio, rich-burn engines actually deliver better fuel efficiency than their lean-burn counterparts. The benefits of rich-burn technologies outweigh those of a lean-burn approach in standby applications. 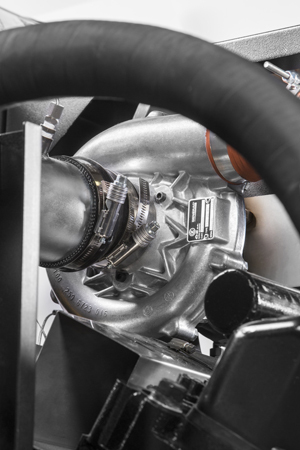 Improved emissions, better starting and load acceptance, as well as superior tolerance of ambient operating conditions are just a few of the benefits to a rich-burn engine. For more information about these concepts or the variety of Generac products available, contact Generac Power Systems at http://www.generac.com or toll free at 1-844-ASK-GNRC. Muhammad Armaghan is a Product Manager at Generac Power Systems. He is responsible for the Industrial Generator product line. Armaghan has experience working in industrial power generation markets and has supervised several multimillion-dollar projects throughout Unites States. These include power plants, healthcare facilities, data centers and municipal projects. Armaghan has also worked closely with consulting and specifying engineers, as well as general and electrical contractors and end users. Sizing With Power Design Pro™? Taking the guess work out of generator sizing can be done with Generac’s Power Design Pro™. The one-stop solution center offers specification sheets, installation drawings, emissions information, a specification text library with full inclusive design notes and the ability to link directly to supporting dealers for budgetary quoting and additional support. If you missed the webinar, you can view it HERE.